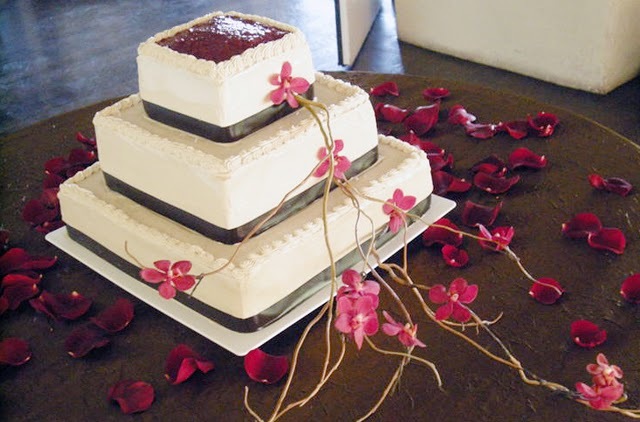 Greenheart Bakery is proud to offer custom wedding cakes. We use 100% organic whole-grain oat flour. We sweeten with fruit concentrate, agave syrup, and maple syrup ---- and do not use refined sugar. Additionally, all cakes are egg and dairy-free, and so are always 100% vegan. We add no fat or oils. Frostings are silken tofu-based (not margarine and shortening-based). Our cakes can be 100% gluten-free, and can be diabetic-friendly as well. For special diabetic needs, your cake may be sweetened with organic birch "sugar" (xylitol). 1. 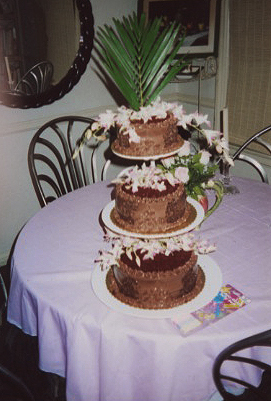 The cake, typically with 3 tiers, with each tier resting on the tier below it. The tiers may be different flavors. 2. The cake will sit on a "ruffleboard" , which is a corrugated cardboard circle covered with lacy ruffle. 3. 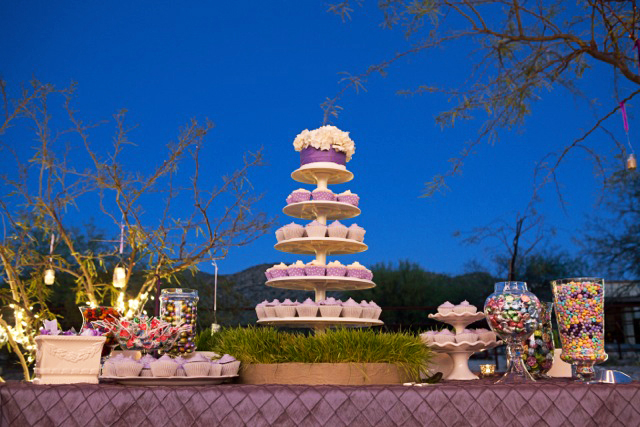 Set-up of the cake at the wedding reception. This includes decorating the cake (with fresh flowers provided by someone other than Greenheart Bakery). 1. The purchase of fresh flowers by Greenheart Bakery, if asked for. 2. Delivery charge is based on actual round-trip mileage from our Tucson, Arizona location. 3. Bigger cakes, and cakes with more than 3 tiers. 4. 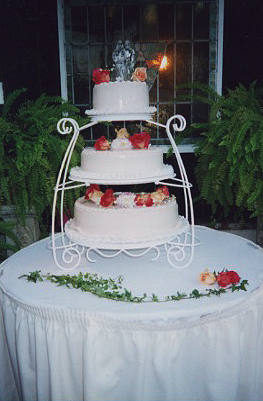 Cakes with "separated" tiers. 5. 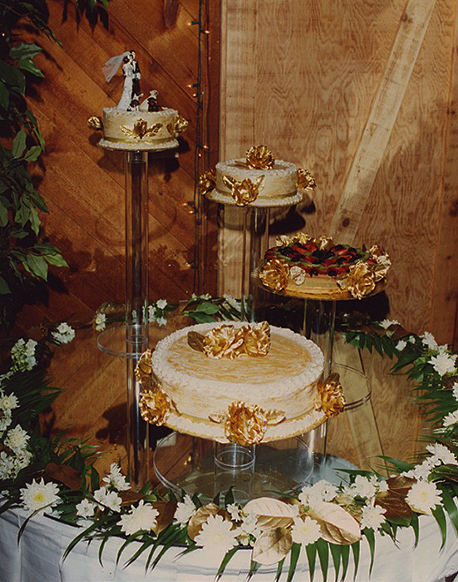 Cakes decorated with fondant, gold dust, or other special features. 6. 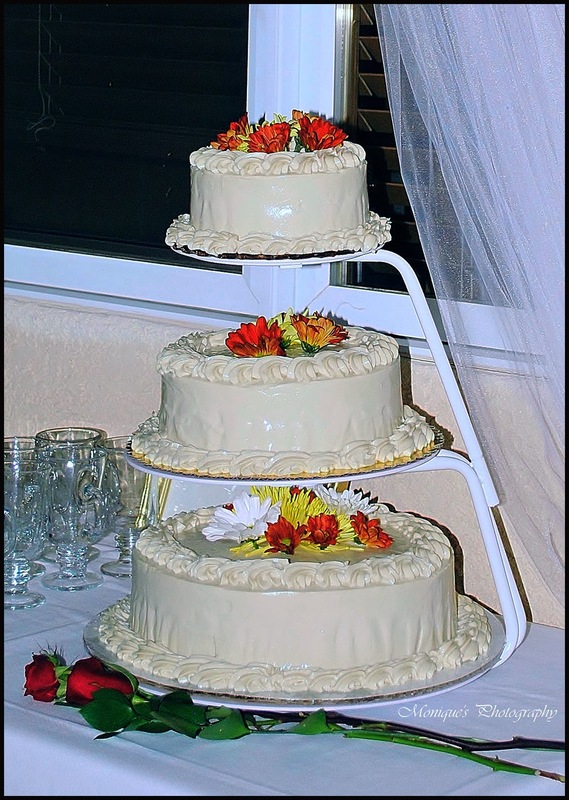 Any special acrylic or other cake stands that may need to be rented. 7. Any additional display decorations or hardware. 8. Additional test-baking to accommodate special dietary restrictions or desires. Your wedding cake is a special part of your wedding ritual and reflects your taste; therefore, a wedding cake is a very special order, customized to suit your needs, desires, location and number of guests. 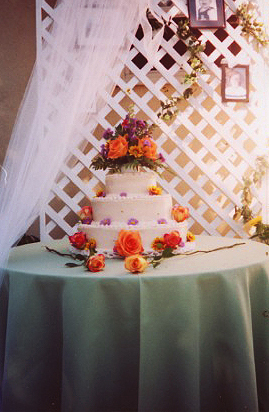 The cake pictured above was for a wedding in Riverside in July 2008. 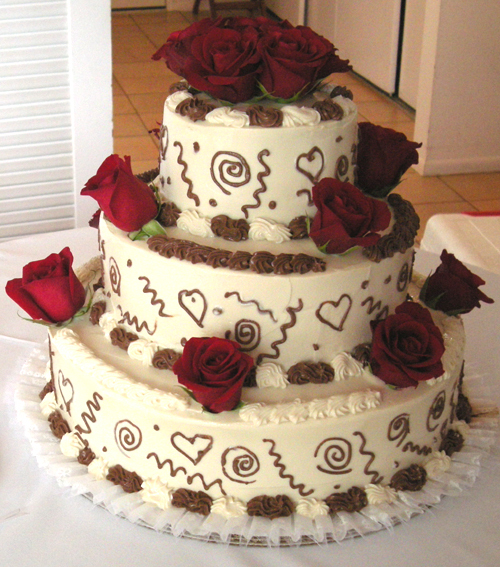 A classic three-tiered cake, it is gluten-free chocolate, and triple-frosted: first in chocolate frosting, then vanilla, then decorated with chocolate frosting designs. Fresh red roses complete the look. Chocolate is always a favorite! 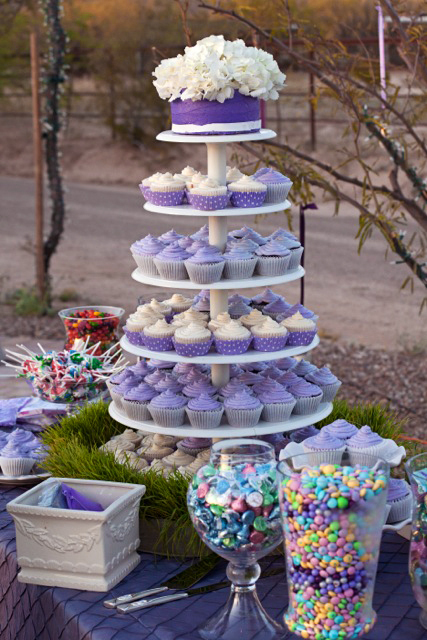 Tony and Sarah's Wedding Cupcake Tower!! We had such a wonderful wedding and your beautiful cake was an absolute HIT!! I can't tell you how many people came up to us and complimented the design and taste. 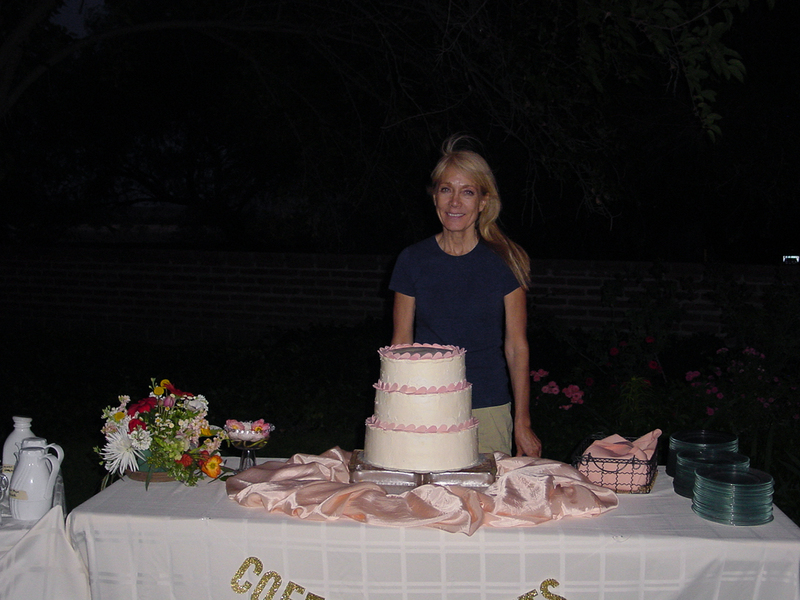 Thank you again for your hard work and dedication to our spectacular wedding cake. I couldn't have asked for anything more amazing! As soon as you have your wedding date set, it is the "right" time to schedule a consultation. 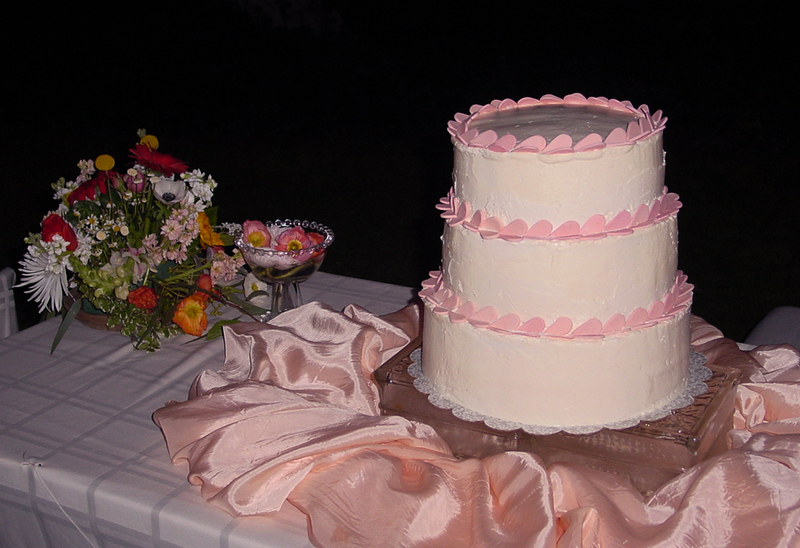 Most wedding cakes are booked months in advance, but we have accommodated couples who were only a month away. After the consultation, we will send you an email so that you have all the details in writing, and the price for the cake. As soon as we receive a 50% deposit, the cake is booked, and your date is held for you. The second and final payment for the cake is due one week prior to the wedding, and that date will be mentioned in the email. Wow! These cakes look amazing and delicious. I remember going to a wedding expo in one of the Los Angeles wedding venues where there were different bakers from different cities that bought wonderfully designed cakes for the expo. Your cakes reminded me of that day, I had a big fat belly after the expo.